This is the last Madhur Jaffrey recipe I'll be cooking for the I Heart Cooking Club challenge. For the next few weeks we'll be on holiday in Cambodia, Laos and Vietnam and I won't be posting any recipes from there. It's a shame I won't be able to complete the last three challenges. It has been fun to try out some of Madhur's recipes, and putting her cookbooks, which had been lingering on my shelf for too long to good use. I found her to be an inspirational cook. I also learnt a lot by reading the recipes other cooks chose. I have followed their journeys with interest, and appreciated their comments.Many thanks to the team who organised it. The Sweet and Sour Aubergines came from Food for Family and Friends. I served it at a barbecue where it sat quite comfortably next to some tabouli, large pesto and mascarpone filled pasta shells with home -made tomato sauce and a mesclun, avocado and cucumber salad. I hadn't previously thought of marrying an Indian recipe with Meditteranean ones but the sweet and sour flavours, and cumin resonated well with them. It was a little too sweet for me, so next time I would add a little more lemon juice or halve the sugar. It also looked a little dry when I lifted the tin foil ( I had added the lesser amount of olive oil) so I sprinkled on a little more olive oil and scattered some chopped coriander on top. Since discovering Hot Samoan Boys chilli sauce I don't bother to buy cayenne pepper. It comes in a sizeable bottle , lasts or ages and I often use it to add a bit of heat to my recipes. In this case a few drops were enough. It wasn't my favourite Madhur Jaffrey out of all the ones I have cooked for I Heart, but it's a useful one. The tinfoil kept it from burning so I could leave it to look after itself while it was in the oven. And it was perfectly happy to be served warm, or at room temperature. I would be happy to cook it again. Hot Samoan Boys Chilli sauce or cayenne pepper. 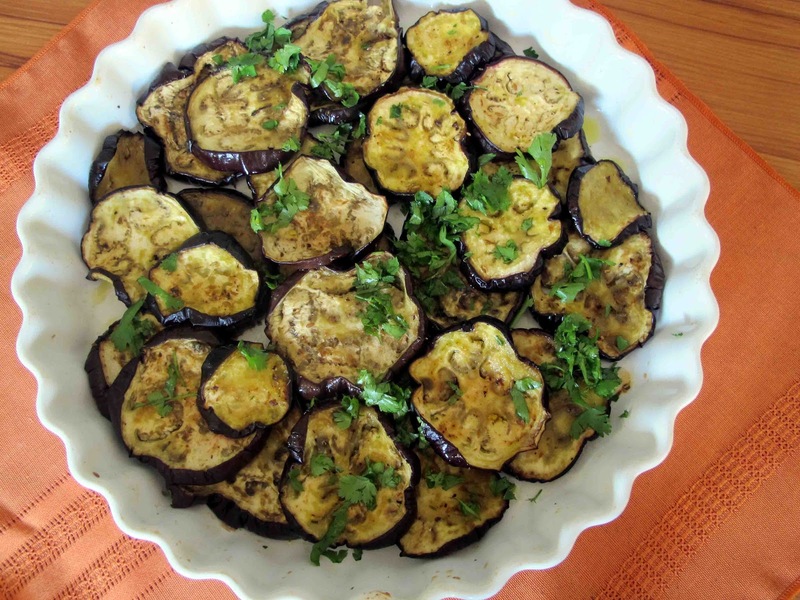 Arrange the aubergine slices in slightly overlapping rows in a dish. Dribble a third of the lemon juice mixture over the top. Repeat this twice, giving three layers in all, each time coating with the lemon mixture. Cover the baking dish with foil and then bake in the preheated oven for 20 minutes. Uncover and sprinkle with freshly chopped coriander leaves just before serving. 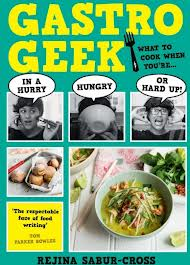 One of Britain’s top food bloggers, Rejina Sabur-Cross, is the author of a new cookbook called Gastrogeek. She is edgy, cheeky and a little rebellious. The layout of her cookbook is funky.The recipes are interspersed with comic style pages. Rejina is a born and bred Londoner who was brought up in a traditional Bengali Household and worked in Japan for two years. Back in London now she is constantly exposed to many different cultural culinary influences. She combines traditional British and Asian ingredients and cooking styles in very inventive and sometimes unusual ways. Such an experimental approach can easily turn into a series of culinary disasters but her recipes work. She knows how to cook. Although still young she has already built a reputation as a food writer and has contributed to The Guardian, The Independent and BBC Good Food. Each chapter in Gastrogeek is written to meet a different kind of challenge or occasion such as aiming to wow, being hard up and hungry, dining meatless, or having the boss to dinner. I decided to try some of the easier recipes to see if her food would be to my taste. · Gouda and cumin cheese gougeres are described by Rejina as “ethereal explosions of glory”. These light and savoury little balls were as easy to make as to eat. The cumin seeds added a spicy lift. Great to pass around with drinks before dinner. It can be enjoyed as an accompaniment to Jasmine rice and a bowl of mixed vegetable miso soup. Or slipped into a cheeseburger for an exciting twist. I liked this recipe, and actually preferred it to traditional kimchee as it was sweeter and not so pungent. The fact that it didn’t need any time to mature also appealed. I thought it was nice for a change but I wasn’t completely bowled over by it. She’d probably think I’m a stick- in- the- mud but it’s hard to improve on the classic kiwi version made with cheddar cheese. · Cardamom chocolate sauce was divine, a mixture of milk and dark chocolate dissolved in coconut milk and flavoured with cardamom husks. She serves it with home-made deep fried churros but I simply poured it over vanilla ice-cream. There are quite a few other recipes in Gastrogeek that really appeal such as the Nectarine and Tomato Gazpacho. This would be quick to make but does have to be chilled well in advance. Her toffee and apple crumble ice-cream, a wickedly sweet combination of toffee sauce, apple ice cream and a hot crunchy crumble topping sounds really scrumptious. Quite a few of the recipes have a more than twenty ingredients and would be quite time consuming to make. And by no means are all of them are cheap. For instance her super deluxe triple cooked chips are deep fried in coconut oil and seasoned with rosemary and smoked salt. They are served with duck eggs fried in truffle oil and a glass of champagne. Hardly the kind of food some-one on a small budget would rustle up. Rejina’s slightly outrageous enthusiasm makes Gastrogeek a very enjoyable read. And there is some really exciting and clever food in it that will challenge cooks to be brave, to try something completely different and to have fun while doing it.